Here’s a real treat—a double-fold promotional postcard for the Nikko Tea House, probably printed circa 1907 to 1910.1 An artist with the initials “W.K.” created the beautiful images and hand-lettered the map and poem on the centerfold. The map has a wonderful depiction of the Nikko and helpfully provides the location of “police traps” on the roads in Westchester. The lines indicating the Hudson River along the left cleverly become strings for Japanese lanterns at the bottom. You surely can’t go wrong. C.K. Nazu is listed as the manager in this 1908 ad (though the last name is spelled “Nezu”). One of our favorite Nikko stories by a New York journalist who stopped for some “skiyaki” in 1931. To see all the posts about the Nikko click the “Nikko Inn” tag in the right hand column. 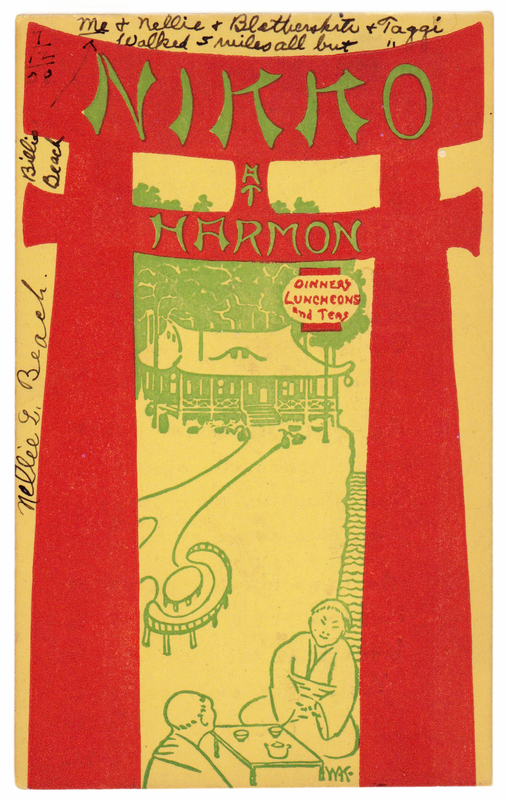 If you have any vintage photographs or ephemera of the Nikko or the early days of Harmon please send an email.